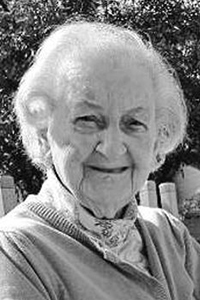 AUBURN – Blanche B. McLeod, 95, formerly of Maple Street Rumford, passed away on Monday March 18, 2009 at Schooner Estates in Auburn, following a long illness. She was born in Rumford on June 28, 1923, a daughter of Francis and Georgianna (Lemieux) Mailhot. Blanche was educated in Rumford schools and was a graduate of Stephen’s High School. She worked for Diamond Match Company in Dixfield, Bass Shoe, Milligan’s Sandwich Shop, and Shop n’ Save in the Deli. Blanche was a communicant of Parish of the Holy Savior. She enjoyed playing beano, cards, reading, doing ceramics and puzzles. Blanche loved spending time at her camp at Worthley Pond with her family; and most of all loved visiting with her grandchildren. Surviving are her children, Dennis McLeod and wife Roxy of Albany, Danny McLeod of Winthrop, Larry McLeod and wife Wanda of Monmouth, and Ronnie McLeod of Florida; two sisters, Jeanne Labrecque of Rumford and Theresa Cioffa of Omaha, Neb. ; 12 grandchildren; and 20 great-grandchildren. She was predeceased by her parents; her husband, Malcolm; a daughter, Sharon Peasley; a grandson, Keith McLeod, sisters, Doris Dephillip and Lorraine Ball; and daughter-in-law, Debra McLeod. A Mass of Christian Burial will be celebrated 10 a.m. Saturday, March 30, at Parish of the Holy Savior. Spring burial will be in St. John Cemetery.